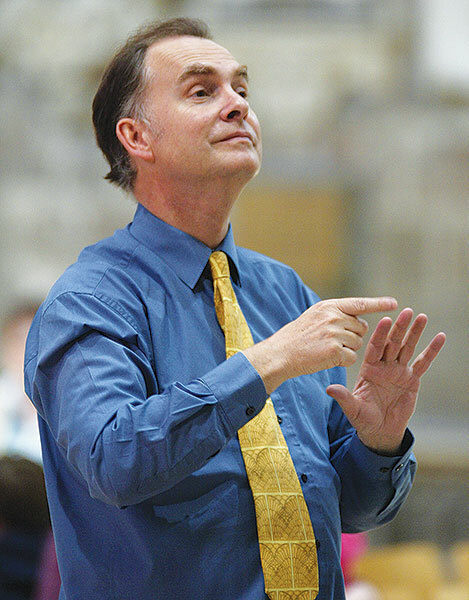 Adrian has been Director of Music at Gloucester Cathedral, joint conductor of the Three Choirs Festival (with the 2016 festival being in Gloucester, he is the current Artistic Director), and Musical Director of the Gloucester Choral Society since 2008. He is also Artistic Director of the BBC National Chorus of Wales and Director of the new choral conducting course at the Royal Welsh College of Music and Drama. Since his BBC appointment in 1999, Adrian has prepared the BBC NCW for almost 100 concerts and recordings for BBC Radio 3, many of which he has conducted himself. He has also prepared choirs for some of the greatest conductors of our time including Haitink, Abbado, Rattle, Tortelier and Elder. Under Adrian’s guidance, Bristol Choral Society remains one of the UK’s leading big city choirs, and gives its principal concerts with the Bournemouth Symphony Orchestra. Adrian has directed many of the country’s principal choruses –The BBC Symphony Chorus, The London Symphony Chorus, The Philharmonia Chorus and the Bach Choir. He has also worked with leading UK orchestras: regularly conducting the BBC National Orchestra of Wales, directing the Royal Philharmonic Orchestra in Opera Galas, Summer Proms and in the Vaughan Williams Anniversary celebrations in Gloucester Cathedral in May 2008; touring with the Mozart Festival Orchestra, and conducting the Philharmonia, the English Symphony Orchestra and the Royal Liverpool Philharmonic at the Three Choirs Festival. When not conducting, Adrian is active as a pianist and organist. He performs with the international Baroque violinist, Margaret Faultless, giving festival recitals both in the UK and Germany, and plays continuo with the ECO, Florilegium – and Collegium Musicum 90, featuring on many Chandos CDs. Adrian was Organ Scholar at King’s College, Cambridge and subsequently enjoyed organist’s posts at St George’s Chapel, Windsor Castle and Worcester Cathedral. We are very lucky to have him.